Coming to SUU on Thursday, August 30, 2018, at 3:30 p.m. in the Gilbert Great Hall in SUU’s Hunter Conference Center, A.P.E.X. along with the Utah Shakespeare Festival present the four-time Emmy Award winning comedy writer and playwright, Mike Reiss. Reiss has spent three decades as a writer and producer for the hit comedy series, The Simpsons. Reiss will be a part of USF’s new play reading series Words3: New Plays with his newest play, Shakespeare's Worst! A Play on a Play. Reiss will be giving a lecture on his memoir Springfield Confidential. The laugh-filled program features rare animated clips and a Q&A. This event is free and open to the public. Reiss’ work with The Simpsons has won him the Peabody Award, a Lifetime Achievement Award from the Animation Writers Caucus along with others. During his career, he also has written jokes for Joan Rivers, Garry Shandling, Johnny Carson, and even Pope Francis! Reiss is an award-winning playwright, mystery writer, and children's book author. 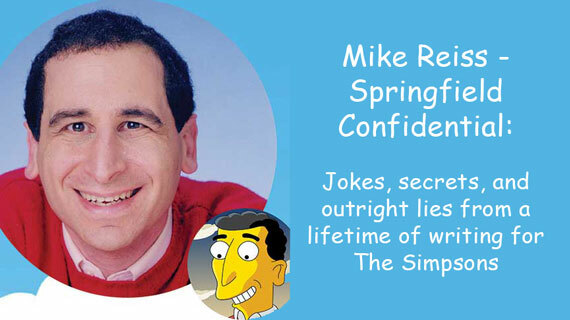 Springfield Confidential, Reiss’ memoir of three decades at The Simpsons, was a best-seller in June 2018. The memoir answers diehard fan questions, illustrates the creation process of each episode, why the characters are yellow, and reveals where Springfield actually is located! After the presentation, Reiss will be signing copies of the memoir. “Shakespeare’s Worst! is an original and hilarious retelling of a Shakespeare classic, this new play is set in a small-town theatre where a group of actors are performing The Two Gentlemen of Verona. But one of the cast members is unhappy: his career is going nowhere, he’s tired of the show, and he wants out. This show promises to shine a new, and hilarious, light on Shakespeare.” Performances for this reading will be held on August 29 and 31 at 9:30 a.m. in the Eileen and Alan Anes Studio Theatre. Tickets to reading can be purchased through www.bard.org and the Utah Shakespeare Festival. Laugh along with this hilarious four-time Emmy Award winning comedy writer and playwright as he tells all. For more information, please visit www.suu.edu/apex or www.bard.org/words-cubed/.